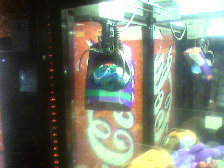 So what happened was I won the prize, but it wouldn't drop, I got it stuck to the claw really good. I tried shaking, asked the attendant (at the bowling place) and he said he has no control over the machines; he couldn't open it up for me. I finally put another dollar in and wiggled the claw a bit then dropped it into the side of the drop chute and it finally fell down.